Have you ever just done some serious decorating while your husband was at work, as in . . . painted a whole room orange? Well, that is what I was up to a few weeks ago. Okay, it wasn’t really a whole room, rather a whole space, like a closet size, and it wasn’t a bright orange. . but rather a deep rust. Since it is going to be a while before we actually get to redo the kitchen and pantry with new cabinets and touch up the plaster (we painted it last summer), I decided to finish the painting job and complete the pantry. I just did a quickie with one coat of paint and touch-ups, not even bothering with the ceiling. However, it looks a ton better and matches the kitchen. 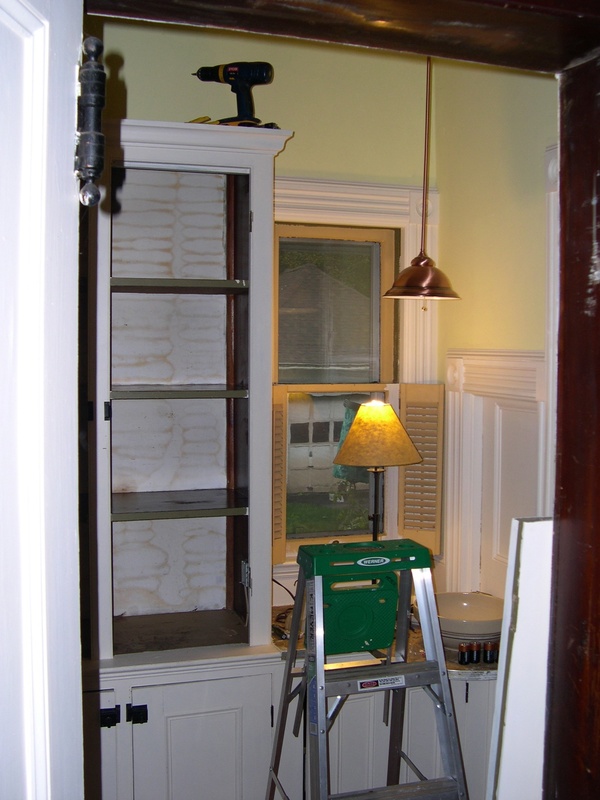 To complete the project, I sanded and scraped the counter between the kitchen and dining room under the window and repainted it to match the woodwork. 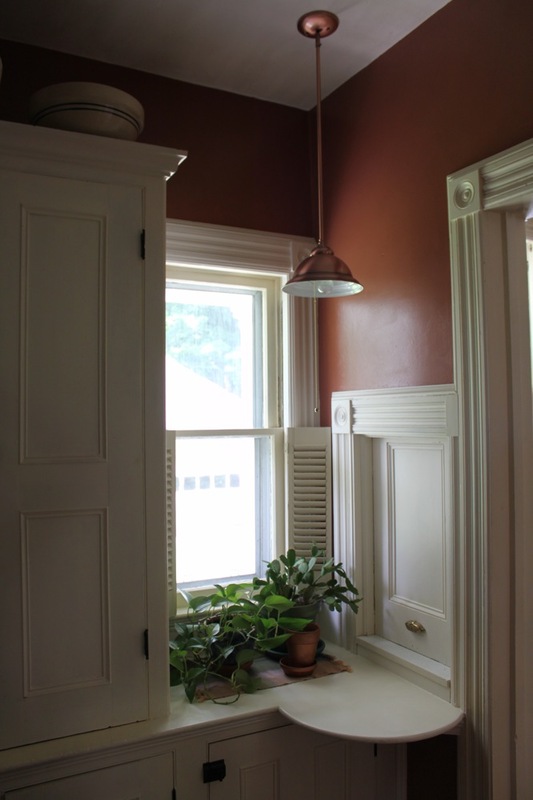 To be precise, this is a butler’s pantry, and the “counter” is under the sliding door that divides the two. See the picture at right. Originally it had a hideous linoleum cover on it which we pulled off last year. I was living with a grungy top for the longest time, but could deal just because it was where I had my plants. However, sanding and repainting it completes the room. The pantry was the first thing we worked on when we moved in. 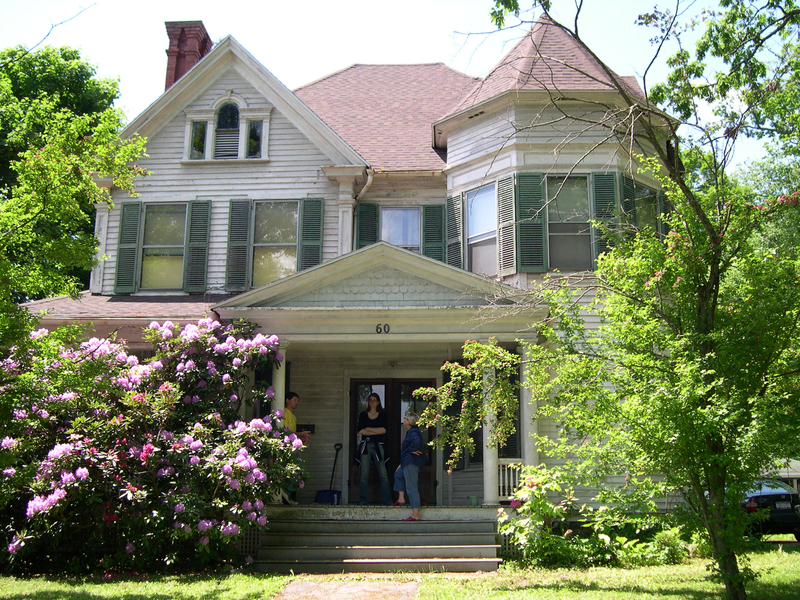 When we decided to buy the house, we actually rented it for a few months while we were waiting for the mortgage to go through, and we didn’t touch major repairs. Instead, we pruned the overgrown garden and painted the inside of the pantry to prepare for our goods. We felt that painting the inside of cabinets would be a renters preference anyway, so we moved ahead. The woodwork was initially that 70s avocado green and the plaster was raw. I bought a neutral white and painted all of it, leaving the shelves bare wood so that Bill could coat them with a polyurethane. And now with the painted walls, which are a deep saffron color rather than “orange” really, it looks rather homey and Tuscan. Posted on July 1, 2011 Author KarynCategories kitchen, pantryTags "butler's pantry"
It is beautiful, Karyn. Everything y’all do is beautiful. i agree- everything you touch comes out amazing!